If you're a meat-and-potatoes lover, you'll enjoy a visit to the Idaho Potato Expo in Blackfoot. The town bills itself as the Potato Capital of the World–it's in Bingham County, which produces more spuds than any other in the U.S.
At the expo, you'll see the world's largest potato chip (14-1/2 by 23 inches) as well as a photo of the world's longest potato, which was just over a foot long. This tuber tribute features lots of trivia, too. Did you know Thomas Jefferson is credited with introducing french fries to America–at a White House dinner? You'll get a quick lesson in potato history and find out why these tubers are so important to Idaho's economy. You'll also see how potatoes are sorted, graded and prepared for consumers. Best of all, the $3 admission charge includes “free taters for out-of-staters”–a baked potato with butter and sour cream. 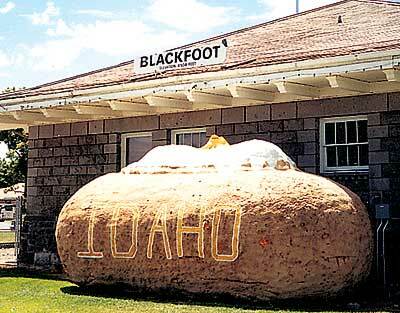 Blackfoot is in southeastern Idaho, between Idaho Falls and Pocatello along I-15. The expo is in a remodeled 1913 railroad depot at 130 N.W. Main St. It's open from May through September. For more information, call 1-800-785-2517.